zona de inestabilidad de la pared. Presenta unamortalidad de hasta el 30%. Thoongsuwan N, Kanne JP, Stern EJ. Spectrum of blunt chest injuries. J Thorac Imaging. 2005;20 (2): 89-97. Kaewlai R, Avery LL, Asrani AV et-al. Multidetector CT of blunt thoracic trauma. Radiographics. 2008;28 (6): 1555-70. Oikonomou A, Prassopoulos P. CT imaging of blunt chest trauma. Insights Imaging. 2011;2 (3): 281-295. Holly BP, Steenburg SD. 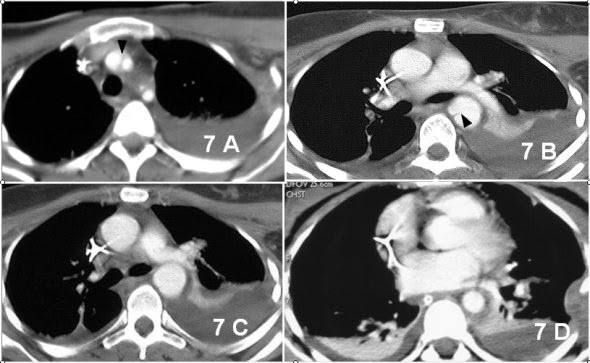 Multidetector CT of blunt traumatic venous injuries in the chest, abdomen, and pelvis. Radiographics. 2011;31 (5): 1415-24. Fraga P. Radiografía del trauma torácico. En: del Cura JL, Pedraza S, Gayete A, editores. Radiología Esencial. 1ª ed. Madrid: Panamericana; 2009.